Get peace of mind with our award-winning UL-certified monitoring station. We’ve got all the steps that put you in command of your system, including what to expect in case of an emergency and how to avoid a false alarm. 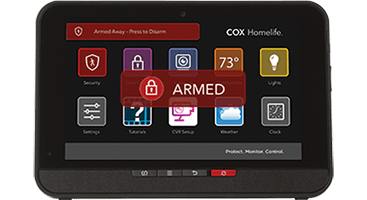 Your Touchscreen Control Panel, Homelife mobile app, and other optional entry devices can all arm or disarm your system. Learn how to use your Homelife system’s security features with the Touchscreen Control Panel. Press the Security App icon. Select Arm Away, Arm Stay or Arm Night mode. Enter your 4-digit keypad code - the countdown to arming (exit delay) will begin. To cancel, enter your keypad code again. Press the Security App icon and enter your 4-digit keypad code. Before arming the system, each zone must be turned on or bypassed and any "trouble" messages must be ackowledged by pressing the OK button that appears next to the message. Before arming your system, select any zones you may wish to bypass. Temporarily bypass zones by touching the "Turn Zone Off" button next to the desired zone. Enter your keypad code to confirm and continue the arming process. Select the desired arming mode and enter your keypad code again to arm the system. Note: Bypassed zones will not be monitored and if breached, they will not be reported to the central monitoring station. Bypassed zones will return to their "ON" state each time your system is disarmed. The 4-digit keypad codes used for arming and disarming your system are chosen by you and can be shared with household members and trusted guests or service professionals. There are five different levels of keypad codes you can have, but please note that there can only be one Master code and one Duress code, and they cannot be deleted. On your Touchscreen, press the Settings App and enter your 4-digit Master Keypad Code. Select the Security category and then select Manage Keypad Codes. Touch the Add Keycode button to create a new one, or the Edit button next to existing keypad codes to make changes, and press Save. Note: You can also manage your keypad codes through your Homelife mobile app. Simply sign in and go to the More menu, then select Keypad Codes. Whether you're at home or away, don't panic if an alarm sounds. Upon notification of an alarm, the Central Monitoring Station will attempt to contact you or persons listed on your Emergency Dispatch Contact list - only those who are set as “verify alarm before calling police”. Your Central Station Passcode (secret word) must be provided to the Operator in order to cancel a false alarm. ** This is different from your 4-digit keypad code used to arm and disarm your system. If there is no answer or an incorrect secret word is given, the operator will immediately dispatch the police or other emergency personnel. Additional emergency contacts may be notified after dispatching emergency personnel, if applicable. *The Central Monitoring Station operator will not indicate if an incorrect passcode (secret word) has been provided, and will proceed with dispatching the proper authorities. If you need to speak to an operator, please call 1-877-404-2568 and press option 1. Note: Process may vary in Las Vegas with an added verified response. **Some communities charge a fee for responding to a false alarm, so please ensure your Emergency Contact Numbers are always up-to-date. See more info on Emergency Dispatch Contacts and tips for preventing false alarms. Operator calls two numbers on your emergency contact list to verify alarm. If there is no response, or an incorrect secret word is given, the police will be dispatched and responding parties will be notified. Operator calls two numbers on your emergency contact list to verify if assistance is required before dispatching paramedics, and then responding parties are notified. Operator calls the first number on your emergency contact list before dispatching fire rescue, and then responding parties are notified. For CO alarms, operator calls both “call to verify” numbers on your list. Silent alarm signal is sent to the Central Monitoring Station. For silent panic signals, operator calls the first number on your emergency contact list before dispatching police. For duress signals, police are dispatched immediately. Then responding parties are notified. Operator will call two numbers on your emergency contact list to verify the alarm. If there is no response, responding parties will be notified, but authorities will not be dispatched. In an emergency, a panic alarm can be sent directly from your Touchscreen Control Panel or other optional entry devices, like a wireless keypad or key fob. 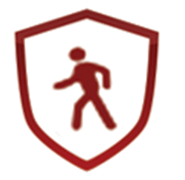 A panic alarm is reported immediately to the monitoring station without delay. Press the Panic Alarm button on the lower right of your Touchscreen. Select Fire, Medical or Police. Tapping Fire or Police will sound a repeating high-pitched siren. Tapping Medical will sound a repeating three-beep signal. Note: A silent option is available when pressing the Police Panic Button. Follow the steps below to easily cancel an alarm. Save our Central Monitoring Station’s caller ID number 1-800-633-2677 to your phone’s contact list so you can quickly recognize incoming alarm notification calls. Choose a name such as “Cox Central Station” or something similar. 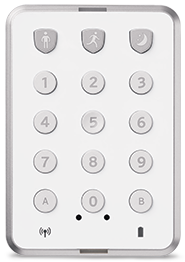 Enter your 4-digit keypad code on the Touchscreen's security screen or keypad to disarm your system. If you forgot your code or take too long, wait by the phone you set as your primary Emergency Contact Number. When the operator calls, speak or spell your secret word to the operator to cancel dispatch of emergency personnel. Note: Some communities charge a fee for responding to a false alarm so please ensure your Emergency Contact Numbers are always up-to-date. More Info. More tips to prevent false alarms. Learn more about your Touchscreen Control Panel, equipment options and how it all works together.